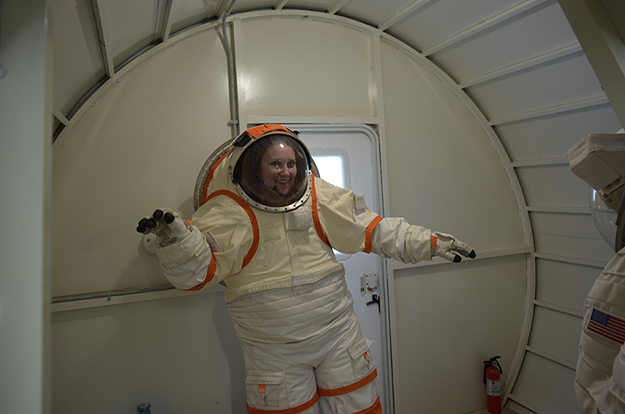 Laura Banken, a graduate student in UND Space Studies, is among the three crew members of Mission VI in the Inflatable Lunar/Mars Habitat. Starting today, they’ll spend the next two weeks conducting a variety of research. Photo by Dima Williams/UND Today. Laura Banken reached for the bar above her head and tried to pull herself up. Lodged in a round gap on the wall, half her body was in the small room. Her legs rested in an adjacent chamber, inside the lower part of the spacesuit she was clambering out of. It took her several jumps to emerge from the Michelin Man-like ensemble. Inside, her back was cold but her face perspired. Outside, she grinned as she adjusted her tight sports shirt and leggings. That was her first time donning – and exiting – a spacesuit. In the next 14 days, Banken will wear the spacesuit several more times to complete tasks during UND Space Studies’ sixth mission in the Inflatable Lunar/Mars Habitat. The team entered the habitat at noon today. Conducted and funded in collaboration with NASA, the project confines a crew of three – Banken and Anamika (who goes by her last name only), both UND Space Studies graduate students, and physician, Michael Castro – to an earthly replica of a Mars station; where they conduct experiments and collect data. Pablo de León, an Argentine aerospace engineer and UND Space Studies professor, leads the planetary undertaking through his UND Human Spaceflight Laboratory. 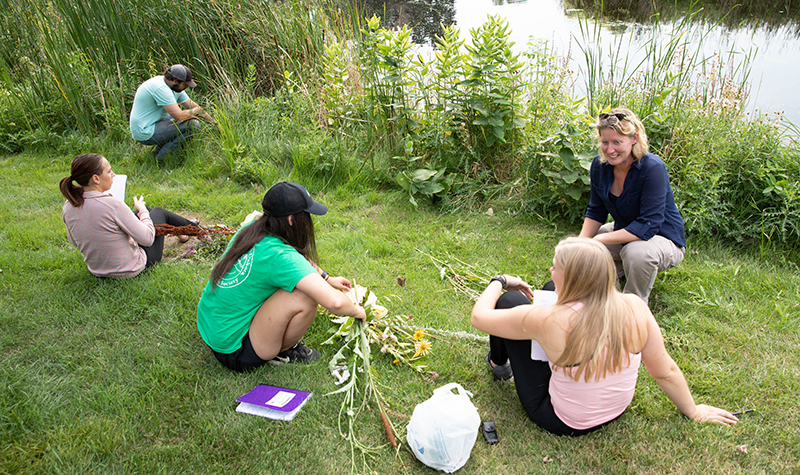 “This habitat is the only system of its kind in the nation on a university campus,” de León said, cuing to UND’s lead in space education and research. 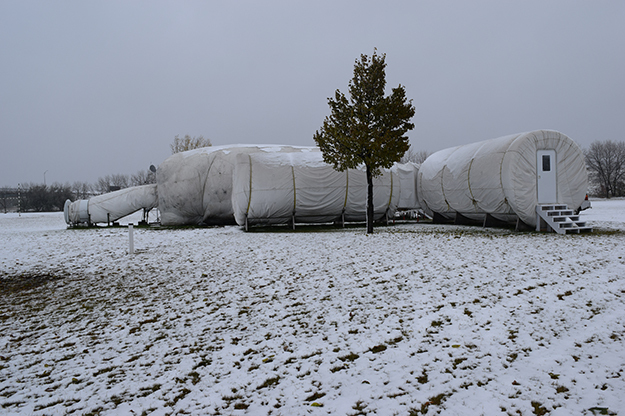 The only system of its kind on a university campus,UND’s Inflatable Lunar/Mars Habitat is home to research projects conducted and funded in collaboration with NASA. During missions, crew members study everything from growing plants in Martian soil to the varied effects of confinement. Photo by Dima Williams/UND Today. On Oct. 10, a mere 24 hours prior to the launch of Mission VI, de León toured the facility, whose white exterior, only steps away from Interstate 29, could easily vanish from sight in the gusts of snow that day. A mass of several modules, it resembled a coterie of pale caterpillars, huddling against the chill. 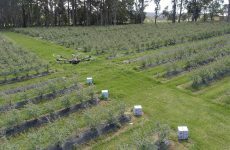 In the upcoming days the crew will tinker with methods to enrich the tawny dirt so that it could nurture vegetables. The lettuces and spinach the Mission VI team will consume, however, sprout from Earthly turf in pots inside the Habitat. The crew will also hydroponically grow young shoots. “These are plants that are just starting,” de León said, looking at a tube, dotted with bundles of fragile leaves. From left, Dr. Michael Castro, Laura Banken, Anamika and Pablo de León wave and shake hands as the sixth Inflatable Lunar/Mars Habitat mission commences. 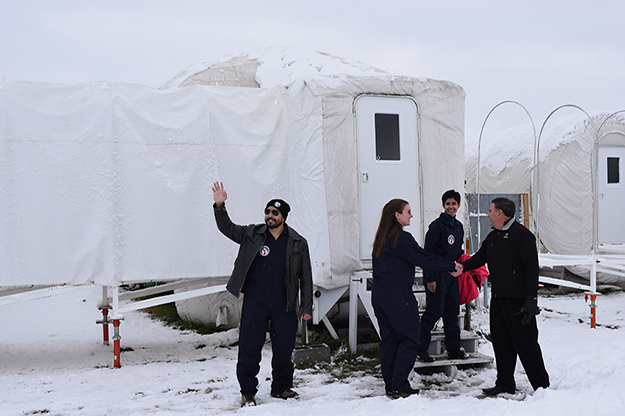 For the next 14 days, the crew will living in isolation within the habitat, conducting scientific experiments in a setting not dissimalar to what they’d experience on the moon or Mars. Photo by Dima Williams/UND Today. De León headed toward the pressurized living quarters. A unit in the heart of the Habitat, it contains three beds, a bathroom, a kitchenette, two plastic tables, a freezer and, at the far end, a hatch. The latter leads to a tunnel, which opens to the outside world. That day, a sheet of snow blanketed its far end. During the mission, a rover ATV will await at the exit for seven extravehicular activities, one every other day. “(These are) kind of space walks,” said de León. 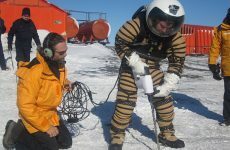 Venturing outside of the Habitat, crew members will operate in pairs to collect and analyze rocks, calibrate and run a telescope as well as launch and retrieve a professional weather balloon. Crew autonomy underlines Mission VI, fostering an experience that better captures what a real expedition on Mars may look and feel like. When it comes to sensibilities, Travis Nelson, a research assistant in the UND Space Studies Department, has joined with colleagues from the University of Minnesota to track the crew’s mental and physical welfare. They will glean the crew’s impressions through daily 40-question surveys and monitor their health with biometric watches and special fitted clothing, dubbed exo-skin. Banken has readied herself. She had done an isolation confinement study on herself in Nelson’s class on “human performance in extreme environments,” she said matter-of-factly. She blocked the incoming light in her house for two weeks and set out to see how she would fare. She monitored her heart rate and blood pressure throughout the hours, counted the calories she ingested and the ones she burned. She also tuned to her emotions. Later in the mission, the crew will be able to do just that in a novel training module, de León said, adding that a geology unit is also under construction. 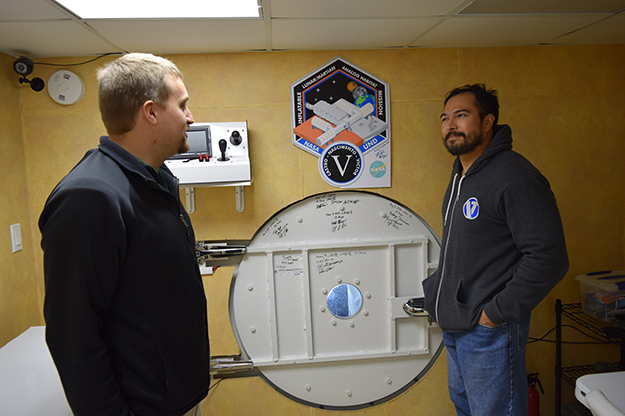 Travis Nelson (left) and physician, Michael Castro, stand next to the hatch leading to their rover used to conduct outdoor exercises. Visible are the signatures of past mission crew members. Photo by Dima Williams/UND Today. Unlike Banken, who is a novice in simulated planetary expeditions, physician Michael Castro is somewhat of a veteran. This will be his third gig – second with UND – and preparations for it were skimp. He did a lot of pull-ups to build the brawn to easily and quickly pour himself into the rigid spacesuits, he said. While the events of the next 14 days are yet to unfold, one thing seems set – or rather scribbled. The white-painted hatch leading the rover ATV boasts the signatures of previous crew members. It is only ritualistic that Banken and Anamika will soon add theirs, next to Castro’s second mark.